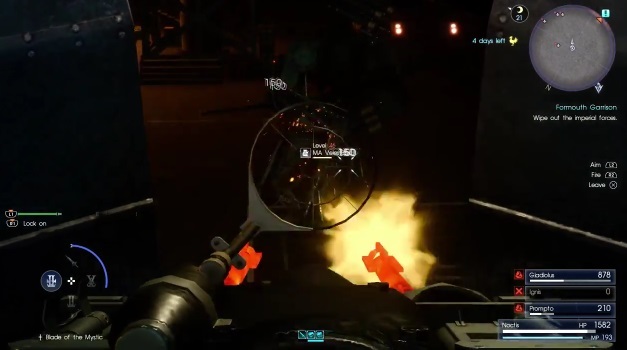 This page contains a detailed walkthrough of Chapter 8 – Seaworthy in Final Fantasy XV, including quests, objectives, items, enemies and bosses encountered in the game. Chapter 8 starts with the gang having some mythril without having any idea how to use it. 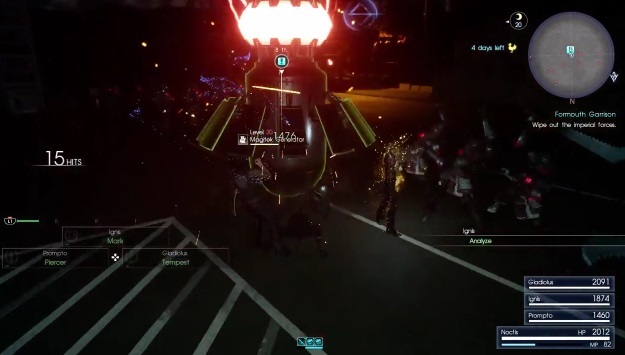 With Aranea Highwind’s help, Noct and the group realize that they don’t have much to go on. The raw ore they have isn’t enough to get them anywhere. Cindy then comes to their rescue to help them find a boat. She says that she has a friend in Lestallum who’s an engineer who knows how to treat mythril. From Chapter 7, we are now on Chapter 8! Seaworthy is where you come across the other diety and most likely will cross Leviathan, the Champion of the Eidolons and Lord of the Seas. 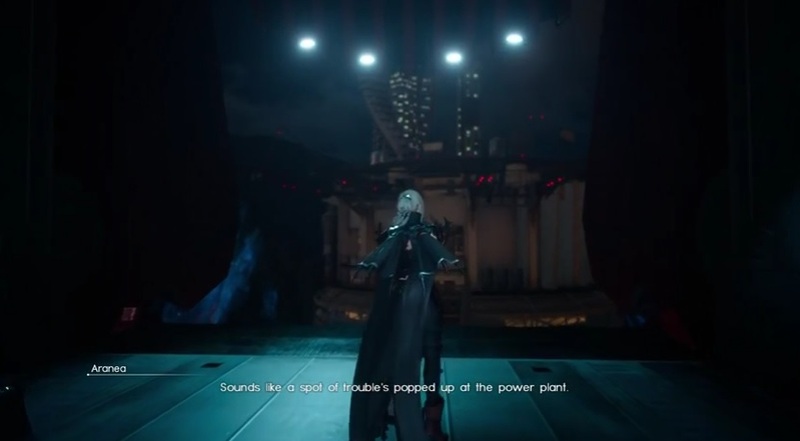 Aranea starts off by showing the boys the power plant. Seeing that she can’t do anything, it’s up to them to be the one to keep the peace. 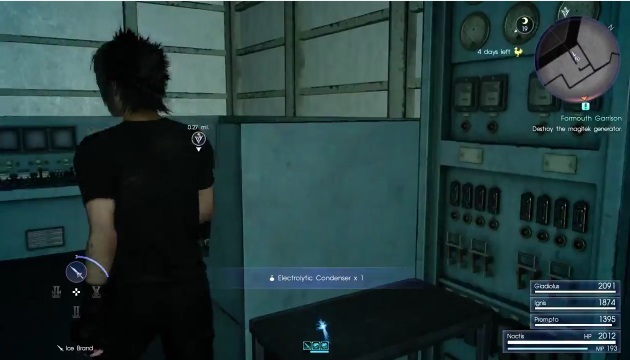 Noct’s made to wear a disguise while clearing out the power plant of daemons and to stabilize the generators. Run across the bridge as Holly thanks you for helping her clear the plant. 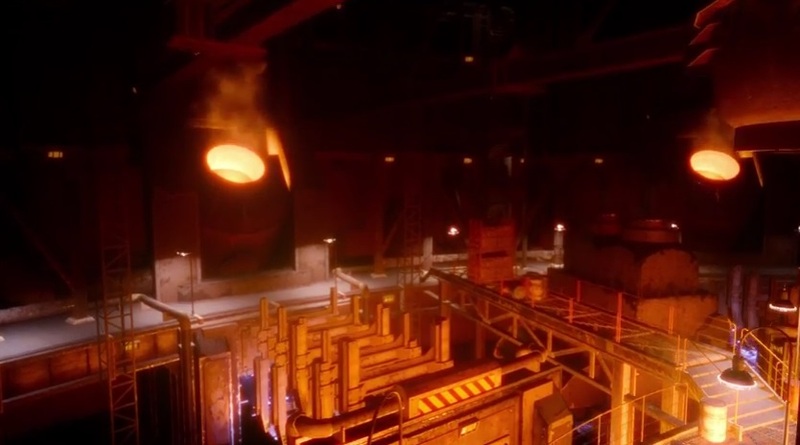 The Exeneris plant was said to be crawling with Daemons and it was impossible to manage the generators while they were there. Your job is to chop ’em up and go on your merry way back to get your mythril. Head straight into the room and Holly warns you about a couple of hunters. Nothing you can’t handle. Reach the end of the bridge where you’ll make a left and meet up with another person who will help you clear out the Daemons. 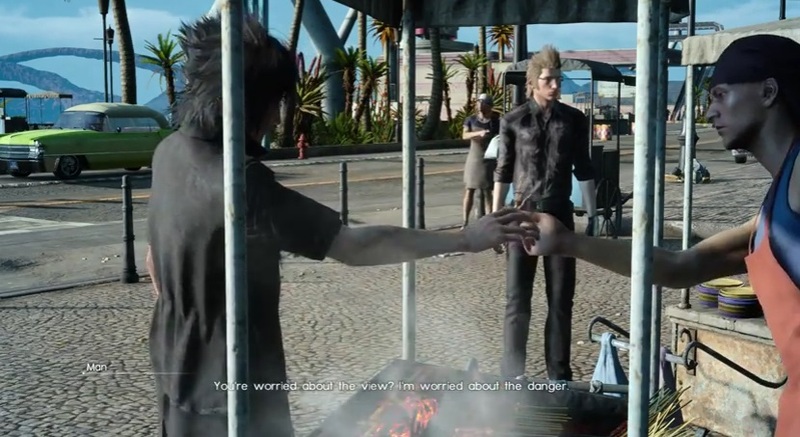 Noctis was under the impression that they were partners but in reality, he was just “back-up”. However, the prince realizes that the hunter sounds familiar but brushes it off. 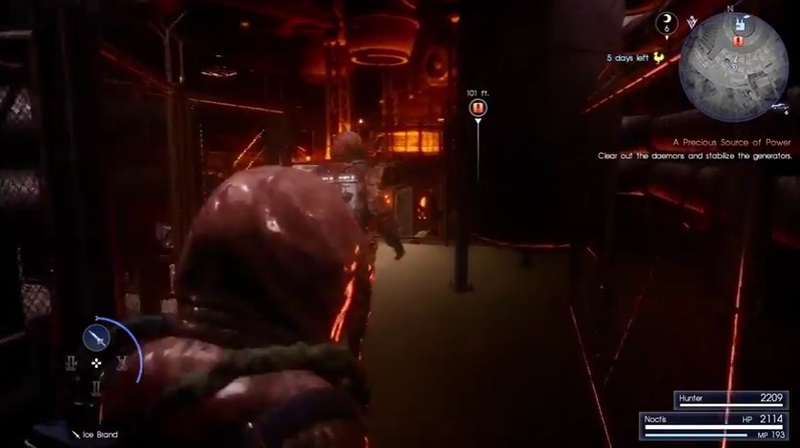 Follow the hunter into the generator area where you’ll begin your mission in clearing out the area. Head up the stairs and then it will show you the entire powerplant. 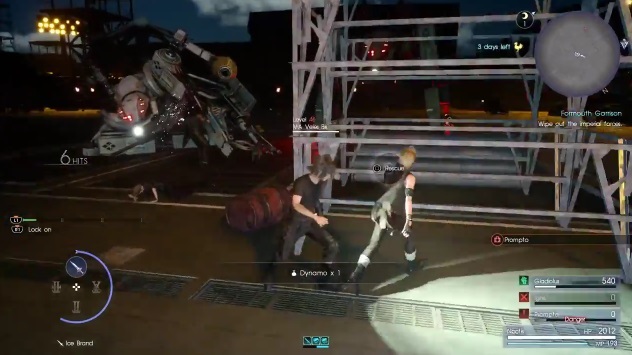 Not only are there Daemons but there are also Magitek crawling around. After that, engage the daemons. Bring the daemons down and Holly suddenly reports that the place is going to blow. 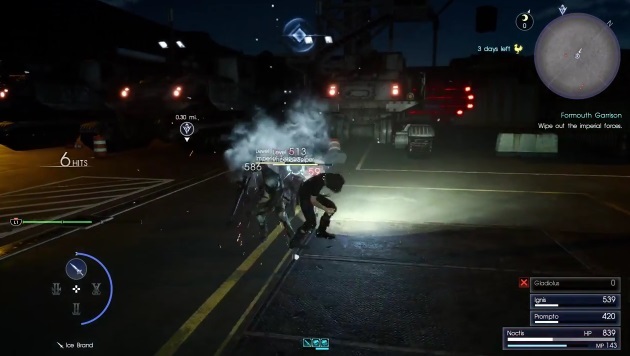 Both the hunter and Noct refuse to leave and you’re made to fight the daemons within the time limit. Defeat them all in five minutes. After defeating them all in five minutes, Holly tells you to leave the power plant which both of you agree to do. Pick up the silver bangle near the controls across the bridge. With that, head out and complete the quest. When you finish up, you also receive the mythril component. When you head out, Holly hands over the component and thanks you for the job. 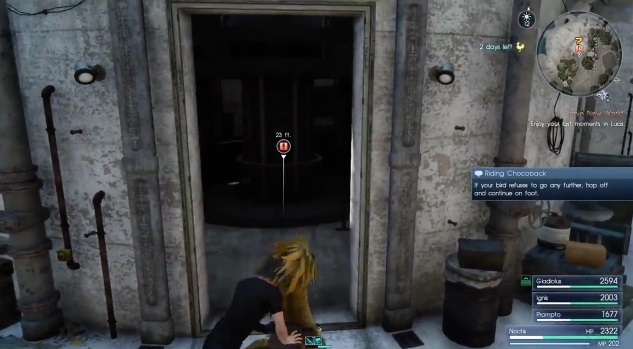 It’s then that Ignis and Prompto find out that the other “hunter” who went in was Gladiolus. With Gladiolus, the team’s complete. 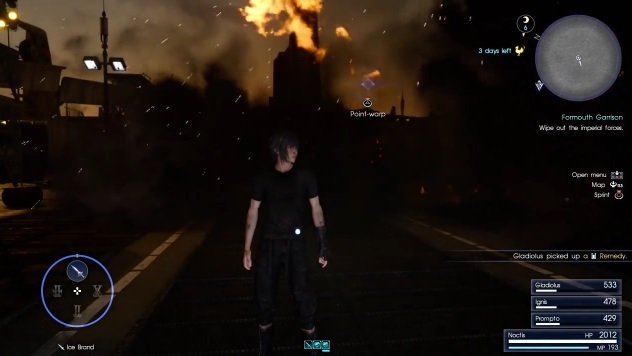 Noct and the gang then leave the powerplant and head off to meet up with Iris and Dustin. The younger sister of Gladiolus is amazed and happy that her brother’s alive while Gladiolus thanks Dustin for looking after his sister. 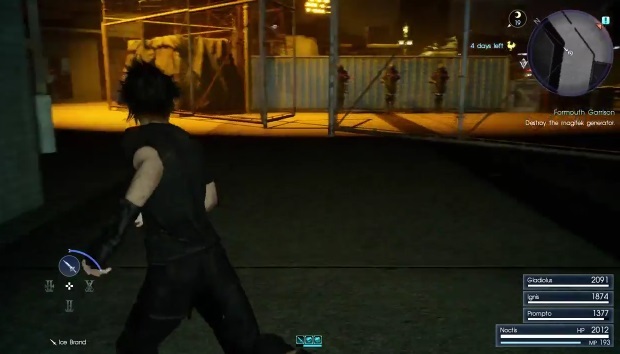 Noct says that Gladiolus already made it up to him in the powerplant. Iris then notices that they now have the mythril component that they can give to Cid. 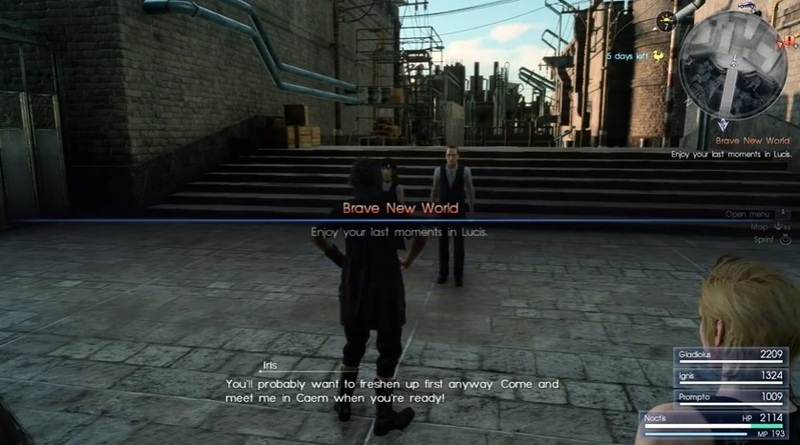 With that, she asks you to go with them in Caem while you get to enjoy your last few moments in Lucis. 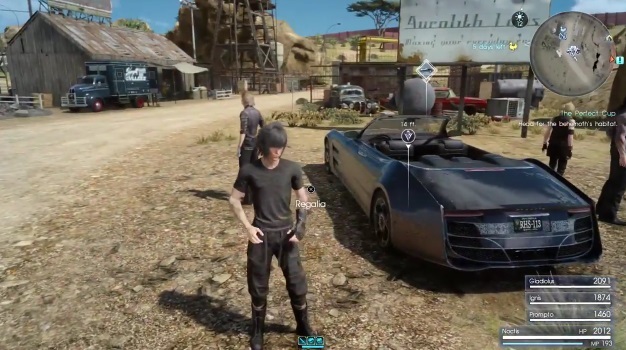 You can venture around Lucis by using the car. 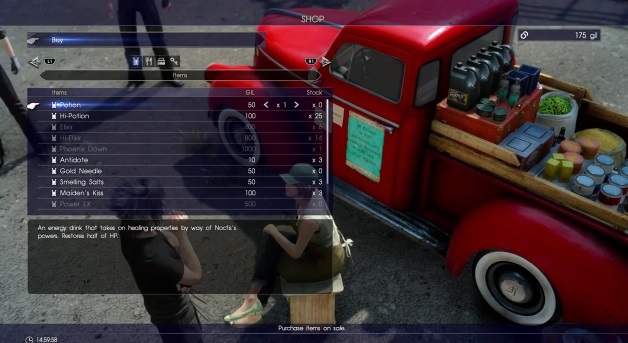 Also, you can go to the Regalia and buy certain things there. You can buy potions, hi-potions, phoenix downs, and even equipment to keep everyone updated with their gear. 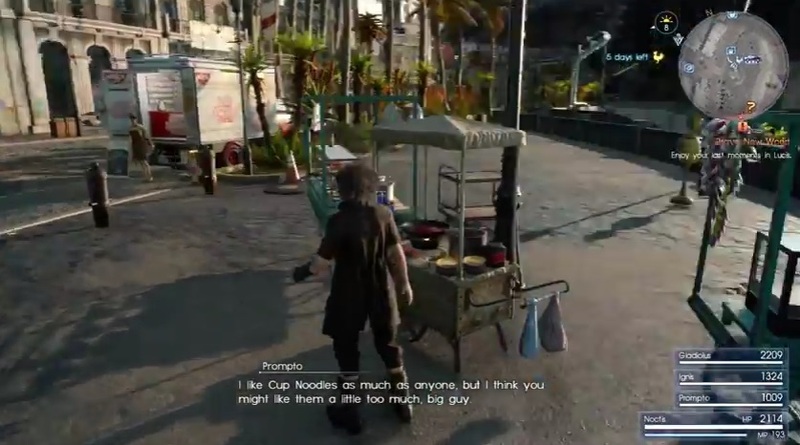 While wandering around, Gladiolus will also mention wanting some cup noodles. Head over to the Noodle Wagon to pick up some. 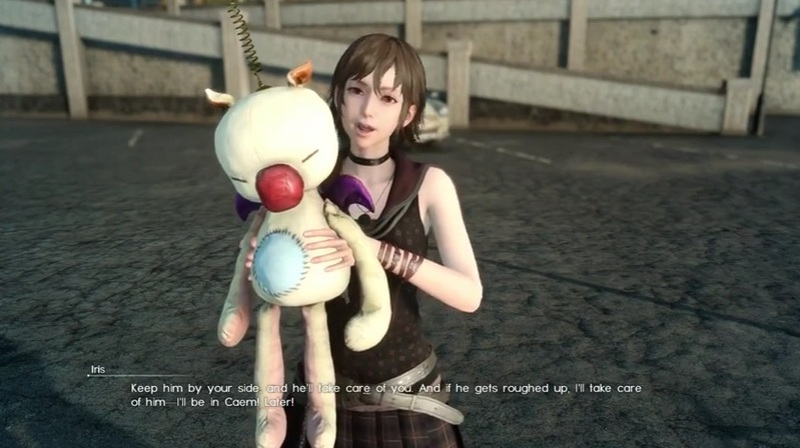 While there, meet up with Iris and she’ll give you a Moogle as a lucky charm. 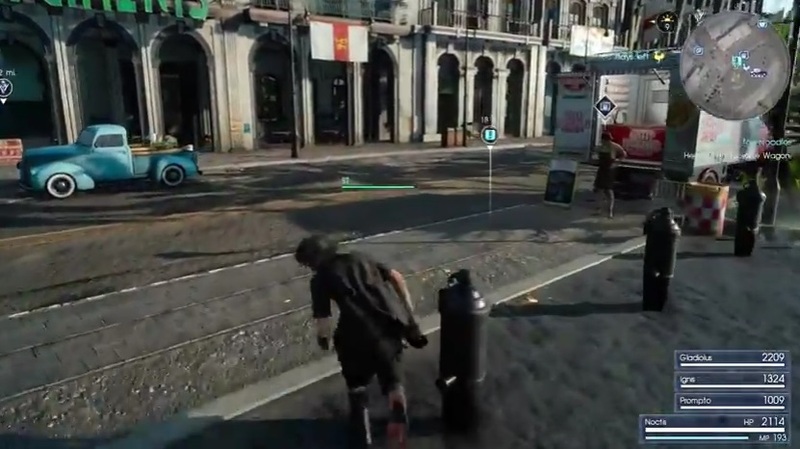 The moogle can serve as a diversion to help you flee battles. Iris’ gift gives you x10 Moogles. After that, head up the stairs and towards the Noodle Wagon nearby. Check your equipment and make sure you’re well-stocked for the next adventure. 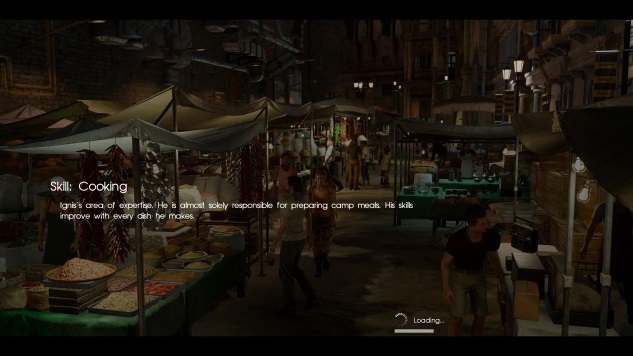 After that, head over to the Noodle Wagon to trigger the cutscene. 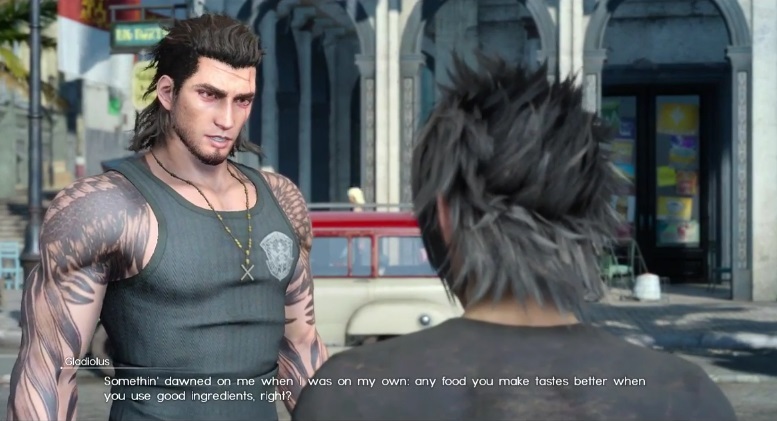 Here, Gladiolus asks how to improve Cup Noodles and figures adding freshest and finest ingredients works. He asks what your favourite is – choose meat. There, you’ll head to the Prairie Outpost. 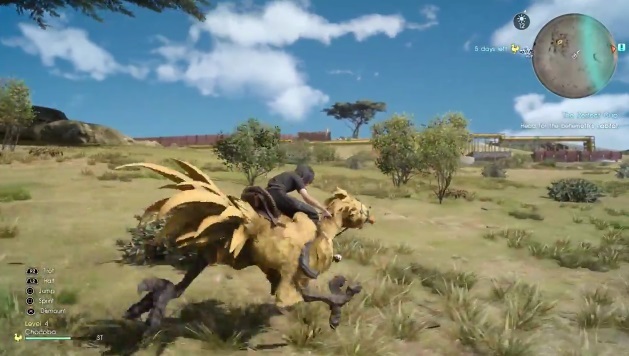 To get to the next part, take a chocobo with you. Follow the road and head over to kill the Behemoth. Cross over the Savannah and head over to the Behemoth’s hideout. While there, you can also trigger a sidequest known as the Formouth Garrison where you’ll invade the base like you did when getting the Regalia back. But that’s a sidequest. Right now, the cup noodles are a bit more important. So, turn away and head towards the Behemoth’s resting area. After a few minutes of running north, you’ll come across the Behemoth. And what you need is not its horn but its meat. Just like how you’ve handled Deadeye, swing around and take out its legs. 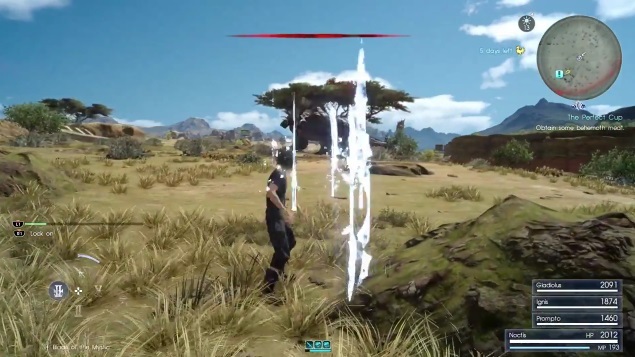 Open by barraging the Behemoth with the blades before launching yourself towards it or you can also use your spells. 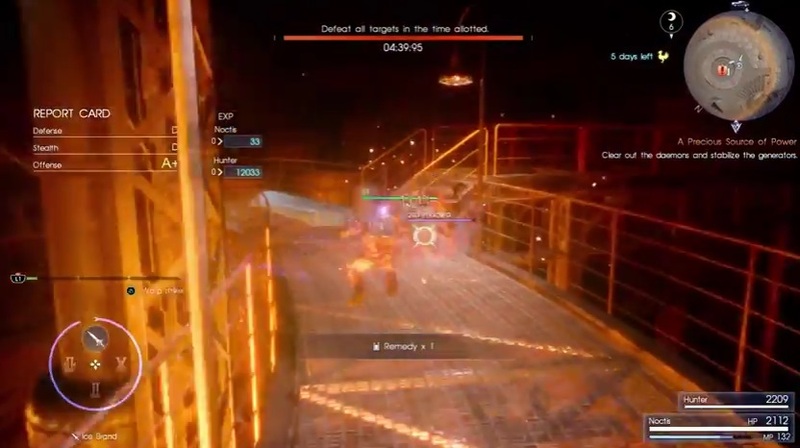 Again have Gladio tank while you and Ignis deal the DPS. 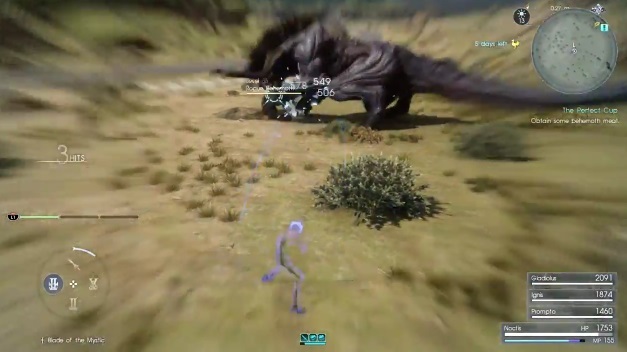 Have Prompto hang around the back and fight with Ranged DPS to bring down the Behemoth. Watch its attack patterns carefully. 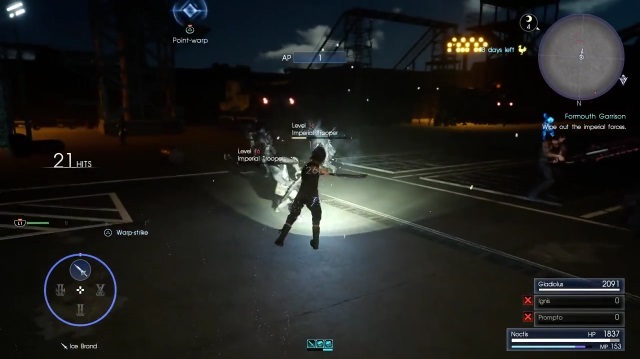 Have Noctis either warp out of the way or parry the charging attempts. Since it’s a larger creature, warp around and use your small size to your advantage. 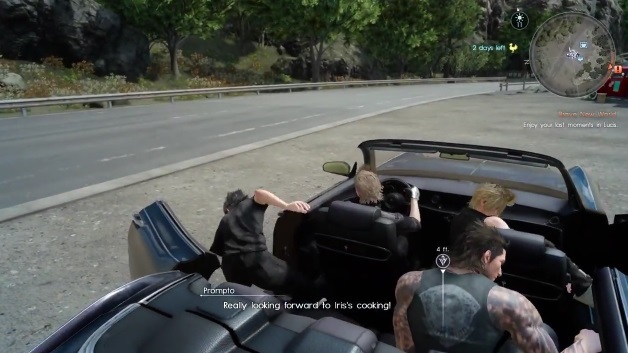 After killing the Behemoth, Gladio insists they go to camp and immediately start cooking. 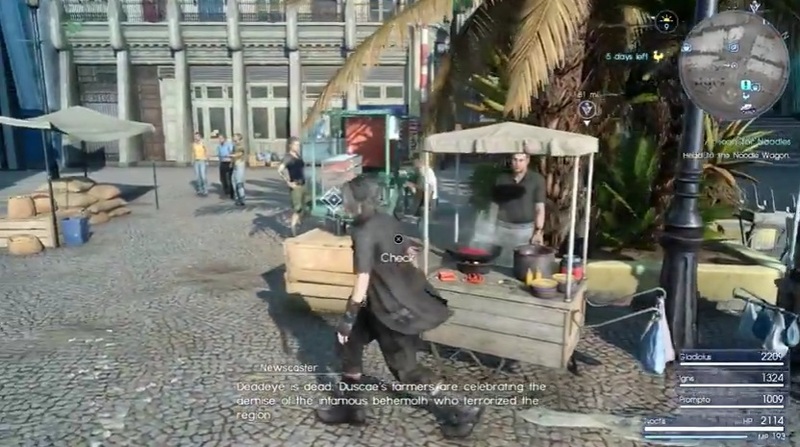 East from where Noctis stands, head towards the camp site to cook the noodles and enjoy. 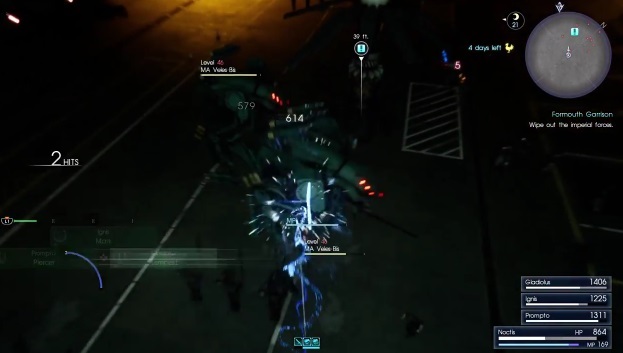 Similar to the mission involving the Regalia, you infiltrate the garrison the same way. 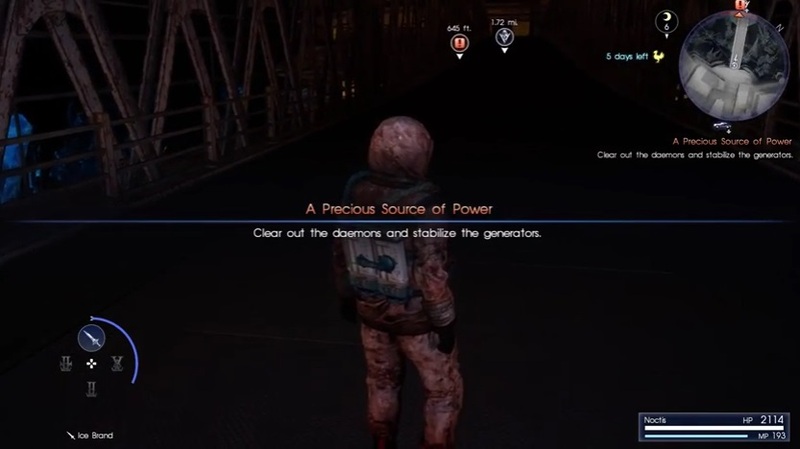 Enter under the cover of night and destroy the generator. While there, enter the control room on the eastern side to pick up the Electrolytic Condenser. You should find it on the table. Next, enter the area where the generator is and warp up on one of the towers nearby. 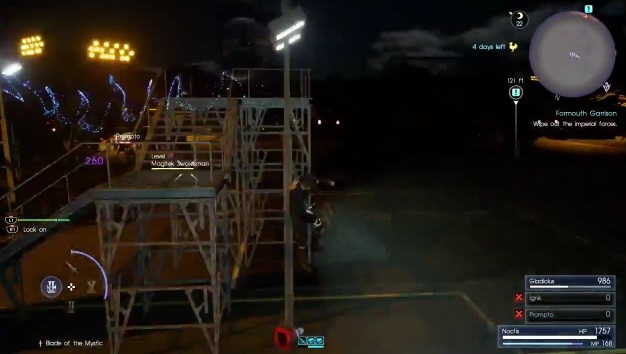 Climb the stairs and take out one of the soldiers there. Turn off the light and move to the next tower on its right. Warp-kill the soldier and take out the light there. Repeat the process until all lights are off. However, should you trigger one of them – head straight for the generator and take it out. Use the terrain around you also take out the smaller soldiers and machines before heading out. Use the guns if you can. You can sweep the fields clean using the cannons. Because there are some convenient towers, use them as they see fit. Or if ever, you can just Rambo the daylights out of them using the turrets. After blowing up the base, Caligo isn’t pleased. He’s going to have a bone to pick with you along with Loqi and a few bunch of Magitek Soldiers. Like any boss battle, take out the little guys first before going for the big fish. 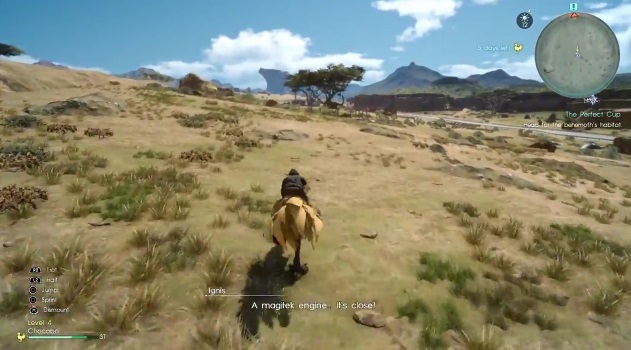 The Magitek soldiers can interrupt majority of your skills so, take them out first. This whole part’s going to be something straight out of The Expendables movie so prepare the guns and start chopping. Magitek Armours and soldiers are going to come raining down on you and you’ll have to survive the battle as much as you can. You’re gonna have to Rambo this stuff out. There will be more zergs pouring out of the ships, so use your healing items wisely. 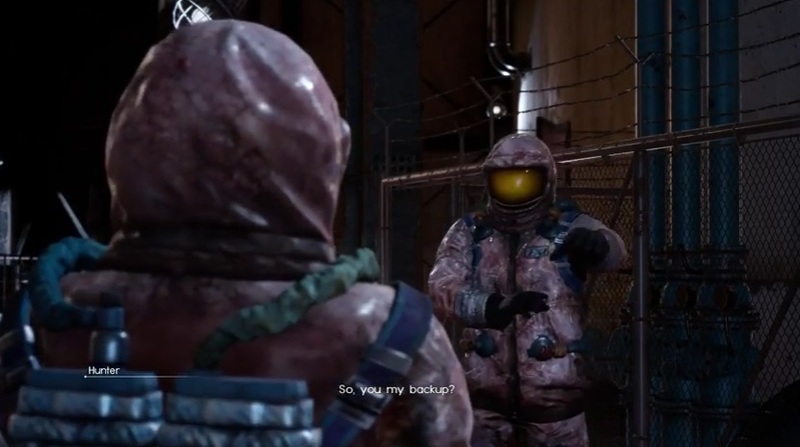 Chapter 8’s been pretty much going Rambo and COD (Call of Duty) on everything. So, by the power vested in the law of Unlimited Ammo, use the turrets. You’ll know it ends the moment you see the Michael Bay style of ending. With that, you complete the quest. As a reward, you also receive the Strange Engine. When you leave, there will also be a Leiden Pepper near a tree. Take the car and head over to Caem. 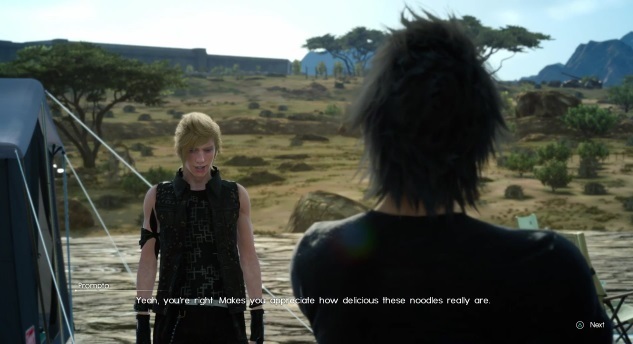 Here, Prompto makes a comment about Iris’ cooking which Ignis chooses to ignore. Here you hear all sorts of comments such as Ravus having the late King Regis’ sword. Don’t forget to buy some healing items from a lady on the side. She has a green visor. After fuelling up, head north through the rocky forest to Iris. 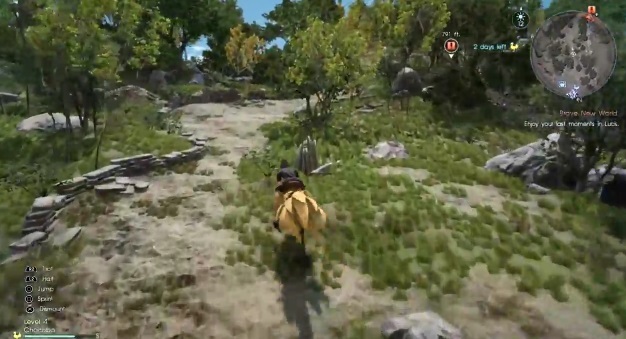 The path is pretty straight-forward so you can just keep running north until you hit the quest marker. At the end of the hill, you come up to a house. Before you do, go around the house and you’ll find a cat that was at Galdin Quay. It has a quest which involves you consulting Monica for some cat food. But instead, head inside and talk to Cid. Give the glass gemstone to Cid for the Engine Blade II. While waiting for the advances, make sure you have everything because once you set sail – there’s no turning back. Save your game first before triggering the cutscene. 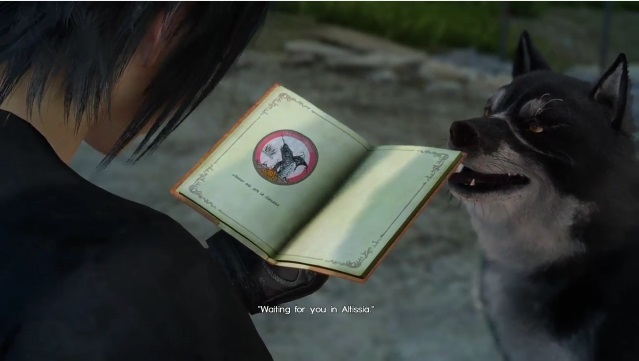 Umbra approaches Noctis and he gets a message from Lunafreya that she’s waiting for him in Altissia. Choose to write there “be there as fast as you can”. Head down the elevator and check your equipment. Walk down the stairs after the elevator stops and trigger a cutscene between you and Cor Leonis. 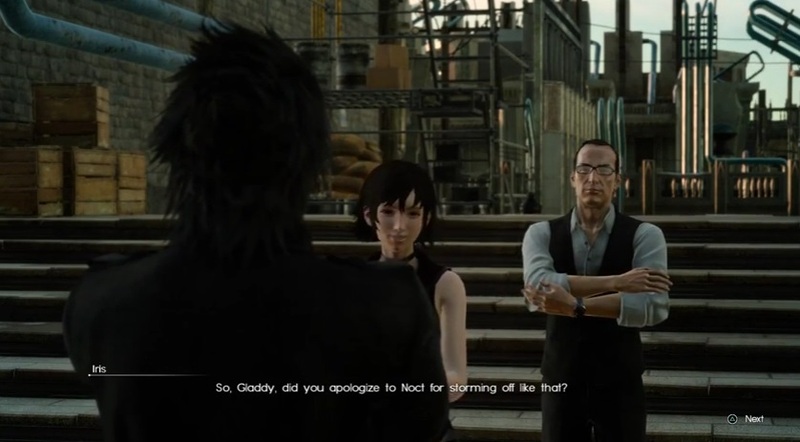 He apologizes to Noctis for not being there for his father. Cid on the other hand says that nobody could have done anything to save King Regis. 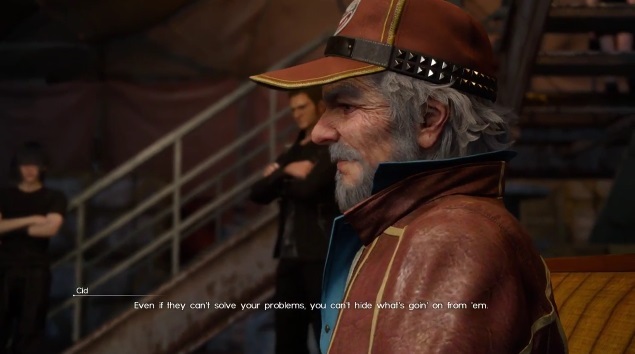 He also tells Noctis to know what he means to Gladio, Prompto, and Ignis. 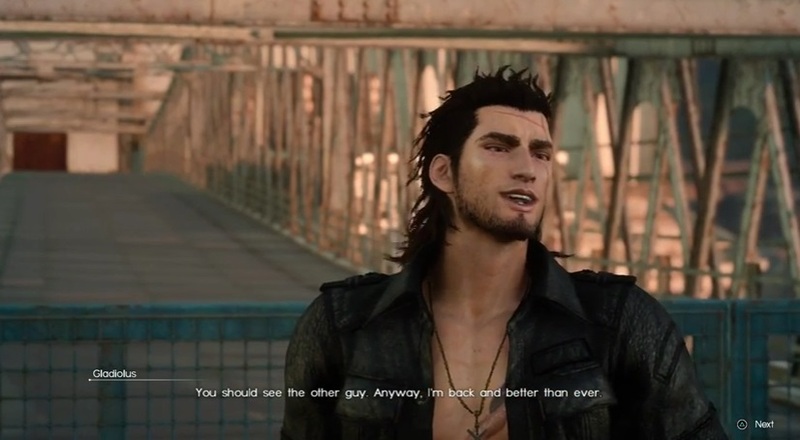 And for him also to remember that, Gladio, Prompto, and Ignis are not just his bodyguards anymore. They’re his brothers. 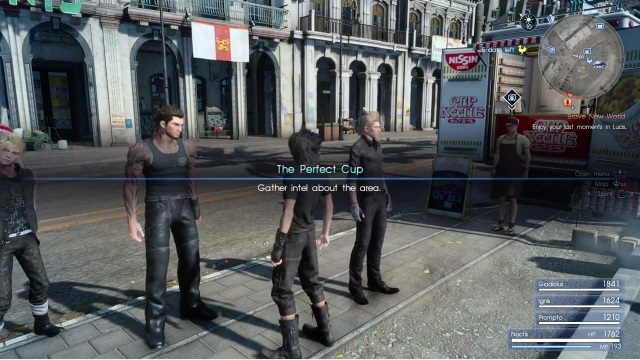 After the cutscene, Cor Leonis hands Noctis a Magic Flask. Fuse some magic and prepare your skills. Check your Ascension paths if they’re all ready to go. After that, head on out and make your way to Altissia.